I thought, as films are a big part of my day-to-day life, I would introduce my thoughts about movies onto my blog. I am by no means a movie-critic but Dave and I watch a lot of films and I like going to the cinema. Sharing my thoughts on them allows me to discuss a different aspect of my interests with you all and, hopefully, will provide an opening for discussion in the comments as well. The latest release in the UK (ignoring the obvious hysteria surrounding 1D: This Is Us) is a highly anticipated interpretation of a rivalry between two of Formula One's most remembered drivers. RUSH has thrilled critics and audiences alike. I'm forced to endure F1 seasons year in year out and, whilst it provides a background noise for me every other Sunday afternoon for almost half of the year, I've never paid that much attention to it. I know the names of the drivers and have a vague understanding of the points system. I know the teams and I know some of the rules. I could tell you who Bernie Ecclestone was if he passed me in the street. That's it. I know nothing about the history of Formula One and had no interest in learning any either. I only know what I've seen since I started living with Dave. Perhaps I've picked up more of an understanding than I thought I have? Nevertheless I wasn't expecting to want to see this particular film when I first saw the trailer for it on TV one evening. The trailer is incredibly fast paced, sucking you in. It hints at an underlying story but gives you a taste of the speed and danger of F1 at the same time. I probably wanted to see the film more than Dave did. I bought the tickets and I convinced him to go. He was worried that, like a lot of films that are touted as 'must-see', the action was all cut into the trailer and the rest would drag. It was a fair point. The last film we'd watched about F1 was about Senna (a brilliant driver that eventually died on the track) - a slow, drawn out film in my opinion that had caused Dave to fall asleep on the sofa and for me to switch over to a documentary. 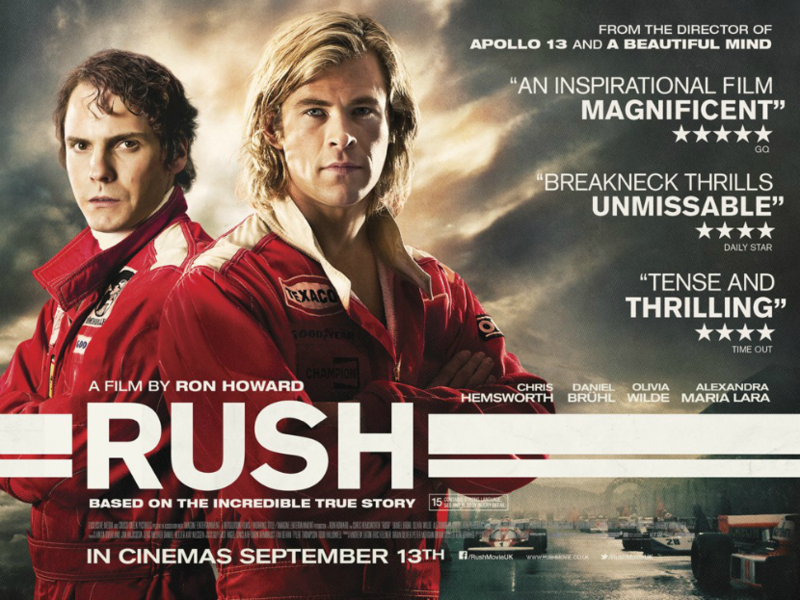 Based on a true story, RUSH invites the audience into a fast paced, thrilling world of a sport that most consider to be nothing more than boys-with-toys and physics thrown into one. From the start it didn't feel like you had to know anything about Formula One to understand what was going on. It was purely about the men: James Hunt and Niki Lauda. Hunt, played by Chris Hemsworth (Thor, Snow White and the Huntsman), is a charasmatic Brit with a dry sense of humor, play-boy attitude and a taste for fast women as well as fast cars. Lauda, played by Daniel Brühl (The Bourne Ultimatum, Inglorious Bastards), is an dislikeable Austrian with one focus: succeeding. There could have been the possibility of turning this into an all out stereotype war: chalk and cheese going head-to-head. In reality the interactions between the two characters is flawless; there's humanity, comedy and a subtle understanding of what each other represents. An overall feeling of respect resonates from each line of dialogue. The performances are confident, touching and believable from a well chosen cast. The story starts from 6 years before the Grand Prix which forms the pivitol point of the film. Both drivers are in Formula 3 and eager to advance. This was a time in the sport where Health and Safety was laughable. The danger was very real and there were two fatalities every year within the sport. The progression through time is very much left to the imagination. There are no real markers, unless you know the exact history of when certain events happened. You're shown how each driver makes it into Formula One, how they deal with obstacles and when they triumph or fail. Then you're bought straight to the 1976 season which is where the action really begins to gather pace, the real driving begins and the fast-paced editing, over-saturated collages and a well chosen score (from the one and only Hans Zimmer - who else?) set you on the edge of your seat. The crashes are choreographed to perfection. Emotions run high. The drama is given the gravity it deserves. Even if you're not a big Formula One fan, and have no real interest in the sport itself, this really is a very good film. The melodrama outside of the race track helps audiences to envisage what the 1970s were all about and give a general overview of the types of values and principles that abounded. The cast, direction, dialogue, editing and score all combine to provide a cinematic experience I believe was worth the price of the film ticket. My only gripe was the ending: a scene where Hunt and Lauda exchange their views on their shared past and experience. It felt as though the writers were floundering for an attempt at a happy ending, or at least some form of triumphalism, that didn't fit with the rest of the film. It plays dangerously close to a The Fast and The Furious ending - the whole 'we've learned to respect each other' ethos - that is obviously aimed at a BAFTA or Oscar judgement panel more than the actual audience. I'll definitely be purchasing this film on DVD when it's released in the UK. It's highly enjoyable and is one of the best action-sports/motoring films I've seen in a very long time. Like I pointed out earlier - you don't have to know all that much about F1 to appreciate the character relationships and overall story, so if you're one for watching something different, this could definitely be the film for you. I've been planning to see this with my husband, and like you...I think I'm probably more excited that his is!